Bipolar Disorder and Substance Abuse: How Are They Connected? 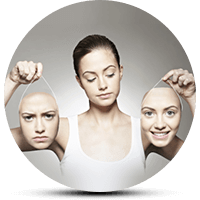 Bipolar disorder is a severe mental health problem that we characterize with manic and depressive episodes. Also, it’s known as manic-depressive illness, which can cause shifts in mood, energy, and, activity levels. All in all, the illness was first addressed by Jean-Pierre Falret (a French psychiatrist), who published an article about this condition in 1851. He referred to this condition as circular insanity. Symptoms of the hypomanic episode are like the symptoms of the manic episode but far are less intense. In most cases, a patient can function in everyday situations, and the disorder can go undetected in this episode. We characterize mixed episodes by atypical symptoms. For example, a person might feel suicidal, but they may also have an excessive need to talk. According to many studies, more than half of the people with bipolar disorder have an addiction problem. Also, substance abuse occurs more often amongst the elderly than in young adults with bipolar disorder. The reason for this devastating data might be that people with the disorder tend to self-medicate with drugs and alcohol. For example, during manic episodes, one might try to calm themselves with sedatives, or during the depressive episode, they may try certain central nervous system stimulants. The truth is that illicit drugs or alcohol actually worsen the symptoms of bipolar disorder. Prolonged use of drugs may intensify the symptoms, perpetuate the episode, and even make a person suicidal. What is the link between bipolar disorder and substance abuse? Both, bipolar and substance use disorders can cause atypical levels of dopamine and serotonin in one’s brain. Due to many overlapping symptoms of the disorder and substance use, it is very difficult to determine where one disorder starts and other ends. Therefore, for the treatment of co-occurring disorders, a team of experts would need to collaborate with the patient and family members. Cognitive behavioral therapy aims at helping patients learn new strategies to deal with everyday problems and to find new stress coping mechanisms. Motivational interviewing is the form of therapy where a therapist and a patient work together to find out what motivates the client to achieve his/ her goals. Solution focused groups are set on concrete goals rather than searching for what caused the addiction or the mental health problem. Trauma therapy aims at revealing hidden memories and traumas from the past that might be the cause of addiction or bipolar disorder. Family therapy is the essence of establishing a strong support system for the addict once the treatment is over. Addiction Resource » What is Addiction: Definition of Abuse » Bipolar Disorder and Substance Abuse: How Are They Connected?